We're counting the last hours this year and I want to wish everyone the Happiest New Year!!! I hope you'll enjoy your New Year's Eve parties and all the last year troubles will be forgotten! Health and loving people around you!!! And this is the last photo this year as well as the last challange! 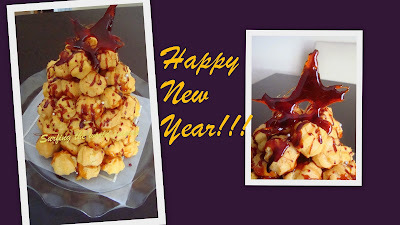 I made croquembouche with caramel. Even managed to form a star for my edible tree. Still I'll continue to decorate them before serving as I'm planning to add some berries and chocolate on it. See you next year!! I also filled profiteroles with basic pastry cream. 1. Put sugar in a pot. Pour over the water and turn on the heat. Do not stir! 2. Boil until it turns light brown. Then place the pot in a cold water to stop cooking. Be very careful while handling with the caramel as it is very hot and might burn easily.